Devon’s father is fond of saying that, if it’s worth doing, it’s worth doing the hard way. His words came back to me as I was sitting in the drifts outside of ARO, simultaneously freezing, sweating, aching and cursing, trying to coax my arms into one more pull of the starter on an ancient and recalcitrant Alpine snowmobile named “Billy the Skid”. The opportunity for this enlightenment began a couple of days ago, when Charles from ARO came by the office. He wanted to know if we could pick up some ancient computers they were retiring. Now, ARO’s just about a ten-minute walk from the station out to the edge of the Clean Air sector. Nice and level, so the obvious thing would have been to grab a banana sled, stroll out there, throw the machines on and stroll back. No muss, no fuss. I’d been looking for an excuse to get checked out on the snow machines here – the various snowmobile-like devices that people are always using to haul stuff around look like soooo much fun. And this was clearly my chance. I cornered Kiwi Dave in the hall. 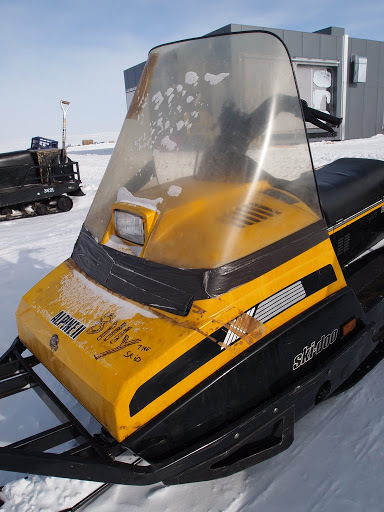 So Rachael, Ricky, Justin and Chris and I followed Dave around the motley assortment of Skidoos, Alpines and uh.. too-old-to-be-unidentified conveyances, noting how many times this one gets primed, where the shift lever goes on that one, and what never to do on this other one. I looked around to see I was the only one with a hand up. I admitted that I was hoping to take a machine out then and there. We got a key from the office, and Dave brought the duct-taped old beast labeled “Billy the Skid” to life with two hard pulls on the starter cord. He verified that I could get it in gear, back up, and do a Figure-8 without falling off or looking too much like a hazard to navigation. Then I was off to ARO for the computers. Next question was how. I’d imagined that there had to be a fairly straight route around the right side of the Station near the Beer Can, but hadn’t actually ever looked. And I didn’t want to look foolish by a) having to double back, or b) getting the snowmobile stuck or c) hitting one of the submerged fuel hoses, setting fire to the entire Station and immolating myself. So I’d take the long route, out toward the pax terminal, past the ceremonial Pole, then back in front of the Station to get the the road to ARO. I was fully aware that if I had simply grabbed a banana sled and started walking, I would have been back at my desk with a cup of hot cocoa half an hour ago. But this was a Learning Experience. The first thing I learned, as Billy and I crossed culvert out past the station, was that I was not dressed appropriately for this little excursion. My mitts were entirely adequate for just walking around the back 40, but now they might as well have been tissue paper. I’d failed to pull my balaclava up after securing my helmet, and my exposed face felt like a rigid sheet of ice. I pulled over to the side of the track, put the handbrake on, and tried to adjust my balaclava to cover the spot where I remembered my face being. Hands were as useless as bricks under the mitts. I remembered the pack of air-activated handwarmers I had in my pocket, and managed to pincer them out into my lap. Looked down at the cellophane packaging with its narrow “Tear Here” strip and knew it would be futile to even try putting my fingers to the task. I did try biting it open, with predictable lack of success. Fifty yards out from station, on my first-ever snowmobile excursion, I was practically beaten. I pulled my hands inside Big Red, ducked my face into the neck opening, and curled into an instinctive I-just-know-there’s-some-warmth-here ball until I could feel my fingers and nose again. Five minutes later, I sat back up on the patiently-idling Billy and plotted my course. Taking my gloves off to tear open the handwarmers seemed unwise, so I decided to ball my hands into little stumps inside my mitts and just count on making it to ARO before they froze off. One stump on the brake, one stump on the gas, and I bounced along the track to my pathetically-nearby destination. Once I’d regained proper use of my fingers and face in ARO, it was time for the return trip. Charles helped me lug the surplus computers out to the front steps of the platform. I carefully adjusted my balaclava under the helmet and placed one each of the “Heats for up to six hours!” handwarmers in each mitt. It should only be a five minute ride back, even the long way around, but I really, really like my fingers, and they were still stinging from getting frozen on the way out. Loaded the computers on the back of Billy and walked through the start routine: six pushes of primer, six pulls on the cord. Three more shots of primer, switch on, cutoff on, and a long fast pull, and…. nothing. “Yes, yes – fine, thanks!” No way I would admit the pit of despair I’d fallen into, “Just having a little trouble getting this thing started.” And I hopped back up as perkily as I could, priming, clearing, switching and pulling with all the faux enthusiasm I could muster. I was still pulling five minutes later, when he disappeared over the rise. Of course it was a matter of personal pride. I had my radio – I could’ve called Dave and asked him to stroll over and bail me out. I was 50 feet from ARO, I could’ve gone back in, had a nice cup of hot cocoa and ginger snaps there, and returned to the task warmed and refreshed. But both of those would have been admitting defeat in some way I wasn’t willing to. This. Should. Be. Easy. Right? The second time I flopped down on the seat in exhaustion, I was seriously thinking of calling Dave. Instead, I dug back to my rudimentary knowledge of two-stroke engines. At temperatures like this, I really needed full choke. But the Alpines didn’t have a choke. You could simulate it, to some degree, by holding the throttle open just a bit. But I couldn’t simultaneously hold that little throttle position up front and pull backwards on the cord hard enough to have any chance of starting the beast. Think, think think. I pulled the pen out of my pocket and wedged it into the throttle linkage, so it held the cable about half an inch from idle. Three more shots of prime for good luck and threw my entire weight into the cord. The engine coughed briefly – only a few cylinders firing – but it was the first sign I had that I was yanking on anything more than an oversized dead pull-toy. Hope blossomed. Three more shots of prime, another lunge on the cord, and Billy sprang to life in an exhaust fume-spewing whine. I collapsed down on the seat and looked at my watch. I’d left the station well over an hour ago on a 15-minute errand. Doing my best to regain a semblance of composure, I tightened my helmet, popped the handbrake and put it in gear. The return journey just had to be easier. And the hot cocoa was calling.